Sometimes you need to protect your hard work from unwanted changes. Maybe you want to restrict access or editing to a select group of people. Perhaps a report is all but finalized, with only one section that still needs editing. Maybe your Word document is actually a form that you want people to fill out, but you don’t want them to modify it. 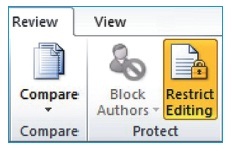 Try these techniques to protect your Word documents. All of them will require entering a password to activate protection. It is very important that you remember it! 3. Select Encrypt with Password and enter password. 1. Select all the text in the document (try Ctrl+A). 2. Review tab > Protect group > Restrict Editing. 3. In the task pane, check the box under 2. Editing Restrictions.